Crowne Plaza is one of IHG's (NYSE: IHG) premier brands for business travelers. We worked with them to design Responsive Websites that matched their new brand experience. Book A Night Here. 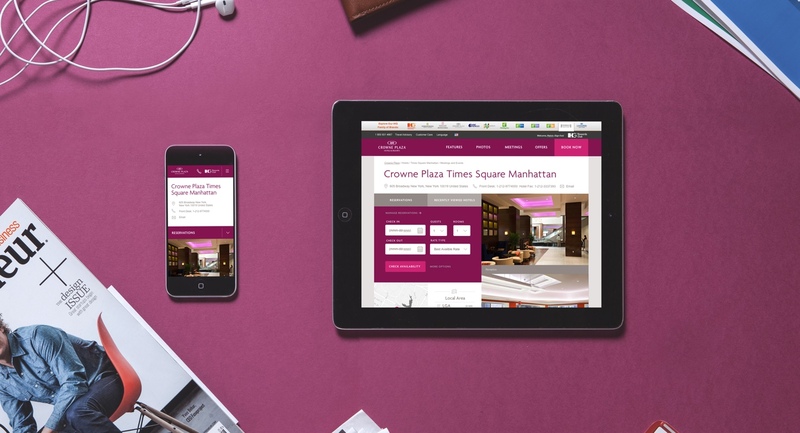 IHG (Intercontinental Hotels Group, the largest hospitality property owner in the world) asked us to help redesign the Crowne Plaza brand’s web experience as part of a larger initiative to help all their hotel websites more closely look, feel and act like their physical properties. They also wanted all the new destinations to be responsive. 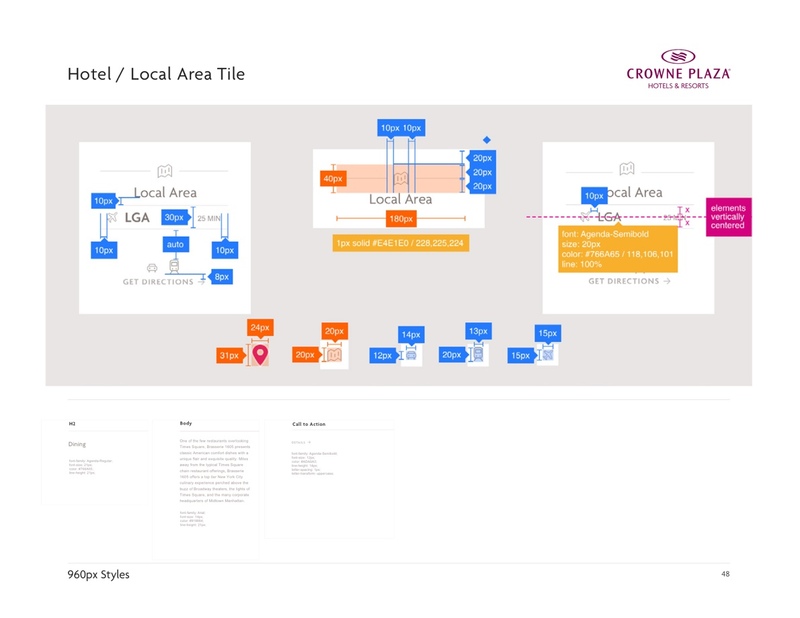 We did all that, but also ended up helping them rethink process, add versatility, and reimagine how their brands connect with travelers online and in-hotel. We traded a coffee or cocktail for customer insight and conversation. We looked closely at what motivates Crowne Plaza’s traveler, the "Striver" -- had drinks with them at the Atlanta Airport bar, read the books they read, traveled the paths they walked and plied their comments with coffeeshop gift cards. We discovered a few things: They’re on the road a lot. They'll work anywhere. They’re efficient, driven, and intently focused on their destination — getting ahead in their jobs. So we decided the best thing a hotel website could do for them was give them what they needed and then get the %^$# out of their way. Our brand directive became “Clearing the Path”, and all design and content decisions flowed from there. Life's busy, so we made things flexible. 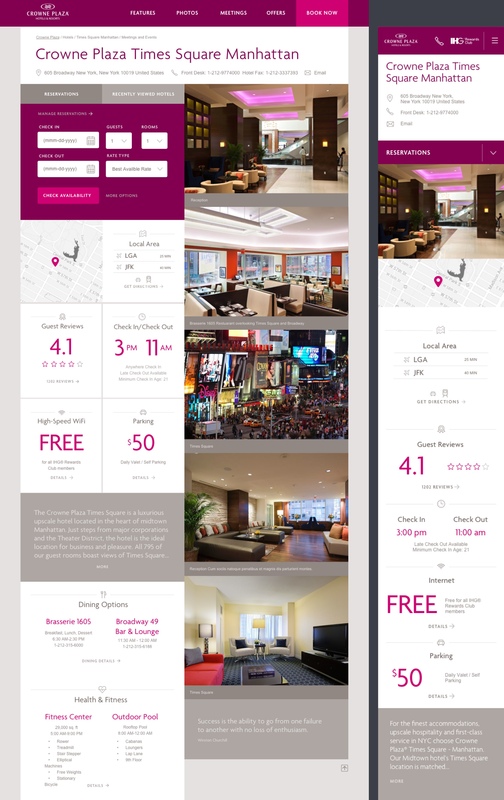 The Crowne Plaza site is built to mimic the digital dashboards Strivers encounter elsewhere in their busy lives. A comfortable grid of moveable components highlight critical info in easy-to-digest chunks, and clean icons make finding necessities easy. We gave massive thought to hierarchy, and built the entire site as modular blocks ready to be shuffled, re-ordered, and re-stacked based on user need and feedback. A balance of systems & swiftness. Behind the scenes, we brought agility to the table, moved more quickly than the typical speed of enterprise, tested early and often, and used iterative design to make rapid revisions. 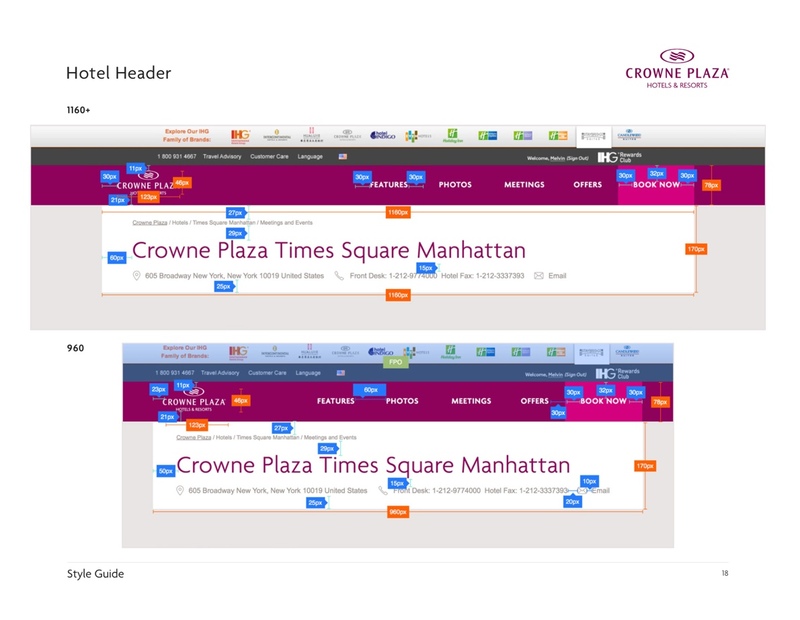 The site tested brilliantly, sales are steady, and IHG has adopted many of our processes in their other site revisions. We’re still working, too — updating other properties and adding efficiencies everywhere we go.